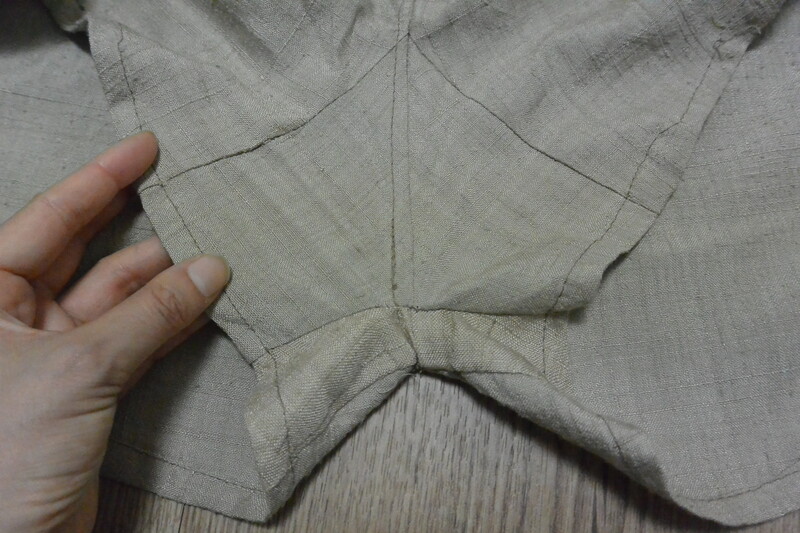 It was a strangely shaped A-line top, kind of cut on the bias and with strings at the sides to wrap around the waist. I took them off straight away, then made darts in the front and back and took in the centre back. So far, so good. But then, the tricky bit – what to do with it next. Making it into a mini dress would perhaps have been the obvious answer, but I didn’t have enough fabric to extend the hem as this was a one-off sample and there was no material left over. Plus, I thought it might look better as a jumpsuit (and I’ve been seeing them on other ladies and liking the looks of them!) – and have you ever seen a jumpsuit with a mandarin collar? No. So I knew it would be unique. Kind of like an Asian safari suit! It was definitely not easy to transform the top because it was cut strangely – I got rid of the asymmetrical front, which gave me just enough fabric to extend the front of the crotch, but I had to use scrap fabric from something else (in a slightly different colour, but not that noticeable) for the back crotch. I used some pyjama shorts as a template to cut out the extra fabric and attach it to the top to create the crotch sections. Yes, very glamorous, talking about extending a crotch!! And definitely not easy with limited amounts of fabric and an irregularly shaped garment (if you wanted to try this you could probably do it with a longish T-shirt, although even then it wouldn’t be the easiest project). So I was extremely happy when I finished it! Yep, so happy I took these selfies in the summer heat in a public place in Seoul (at the Dongdaemun Design Plaza flood field, to be exact… which luckily was fairly deserted on a Sunday morning!). I’m not sure when I’ll next get to sew anything – but I’ve got lots to share about Seoul and my travels anyway, so the next few posts will be about my safari through this urban Asian jungle!